Art South - Near Southside, Inc.
Art South and Hudgins Companies, owner of the Mag & May apartments, have partnered to commission 20 murals at the Mag & May apartment community under construction at 315 W. Magnolia Avenue beside Fixture at the corner of W. Magnolia Avenue and May Street. With the murals now complete, you are invited to go vote for your favorite mural anytime before Monday, December 3. The Mag & May Murals are a project of Art South, a Near Southside, Inc. program connecting artists and culture-investors to each other to build partnerships that increase publicly-accessible cultural assets in the Near Southside, provide opportunities to artists that expand their practice enough to catalyze their careers, and further dialog about the value of artists and the arts in our community. Earlier this year through a public call for qualification, Art South invited artists to apply for an Art South commission of 20 murals on the street-facing stucco stoops at the Mag & May apartments. The stoops range from 15'x4' to 8'x4' and the artists were each paid a fee of $1,000 per mural plus a small supplies stipend. More than 130 artists applied to the call! With a difficult decision on their hands thanks to so many quality applications, the Art South Selection Committee chose a diverse group of artists with a range of experience from highly accomplished muralists to those painting in large format for the first time. The committee curated a cohesive design approach for the overall project that also provided for each artist's unique individual aesthetic and creative control of their mural. Now, we can't wait for you to stop by Mag & May to see their work. OPPORTUNITY TO SUPPORT A COLLEAGUE - The winning artist will be given a lead role on the selection committee to commission an artist for a final Mag & May interior mural with a $3,000 project budget. First, please visit Mag & May (315 W. Magnolia Avenue Fort Worth, Texas 76104) to see all of the murals! They look very different in person and it's fun to see how all 20 murals connect to the new building. You never know which one will speak to you! Remember, there is still construction underway at Mag & May, so please stay on the outside of the fence and remain aware of your surroundings while you look. Then, submit your vote using our easy-peasy, one-click online voting tool. We will ask you for your email address just to make sure no one is stuffing the ballot box, but rest assured we won't be sharing it with anyone else. The winning artist will be announced on Friday, December 14! 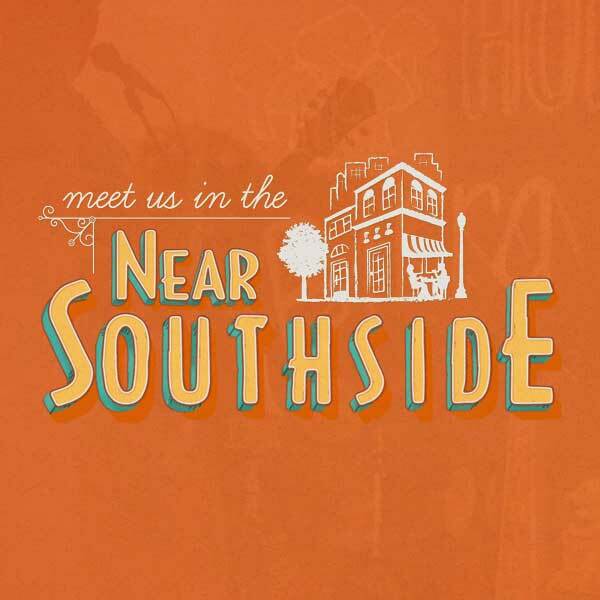 Art South, a Near Southside, Inc. initiative to advance the arts, in coordination with Hudgins Companies announces the Mag & May Mural Commission. Art South and Hudgins Companies are commissioning 20 murals (each 8’x4’ or 12’x4’) along the ground floor stoops of the new Mag & May apartment development under construction on Magnolia Avenue at May Street. Artists will be paid $1,000 per mural and may receive more than one commission. 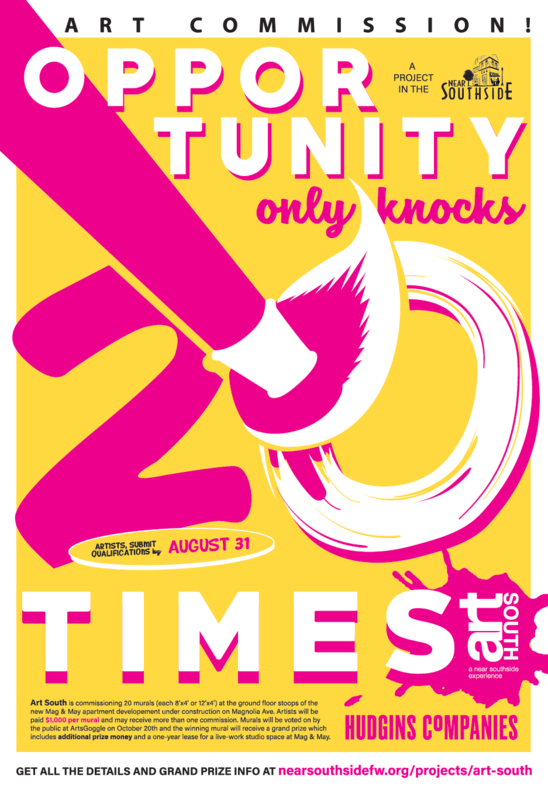 Artists will work with a project advisory board to curate the content, and the winning mural will receive a grand prize that includes additional prize money and a one year lease for a live-work studio space at Mag & May. 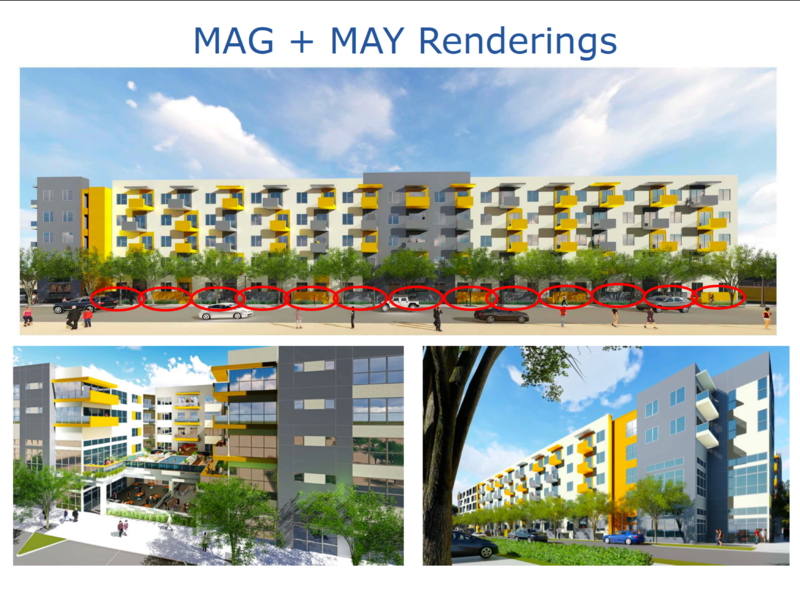 COMMISSION – Art South and Hudgins Companies will be partnering on a privately-owned and publicly-accessible series of mural commissions at the Mag & May multi-family mixed-use project on Magnolia Avenue. Through a public call for qualification, Art South is inviting Fort Worth artists to submit their qualifications. This collaborative commission effort will result in the painting of up to 20 public murals on up to 20 street-facing stucco stoops. Each stoop measures approximately 12’x4’ or 8’x4’. Based on the quality and quantity of artist applications, as few as 2 or as many as 20 artists will be selected for the project, and artists will be paid a fee of $1,000 per mural. The Selection Committee, comprised of representatives from the Art South program and Hudgins Development, will work in partnership with the selected artists to curate a cohesive design approach for the overall project while still providing for each artist’s unique individual aesthetic and creative control of their mural. FREE LIVE-WORK STUDIO SPACE - A complimentary one-year lease for a live-work studio apartment at Mag & May. HERE'S THE BEST NEWS, you don't have to design anything prior to applying. Only those artists who have been selected for the commission will be asked to fully design murals. You also do not have to have previous public art or mural experience to apply. Selection Committee Comprised of Cultural Investor, Art South Program Manager, and three members of the standing Art South Selection Committee to be appointed by the Program Manager. Project Advisory Board is comprised of artists, lead curator, Art South committee member, and Hudgins Development and will stay in close communication to help advise for overall project design cohesion and successful implementation. 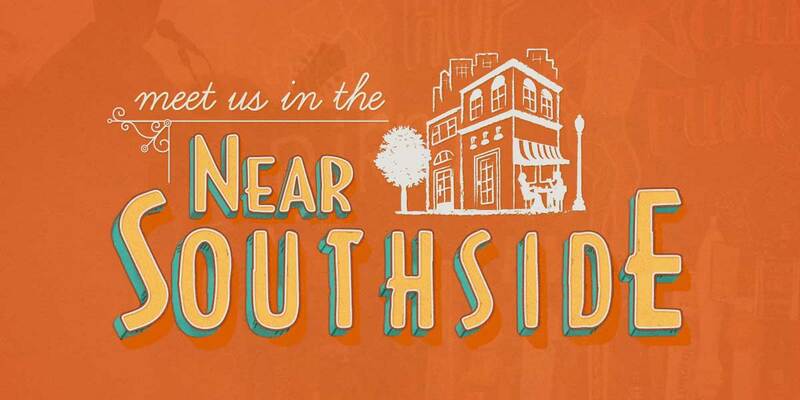 By connecting artists and culture-investors to each other, the goal of the Art South Collaborative is to build partnerships which increase publicly-accessible cultural assets in the Near Southside, provide opportunities to artists that expand their work portfolios to catalyze their careers, and further dialog about the value of the arts and artists in our community and development practices.